I will do the best I can to walk you through the In game mail system. 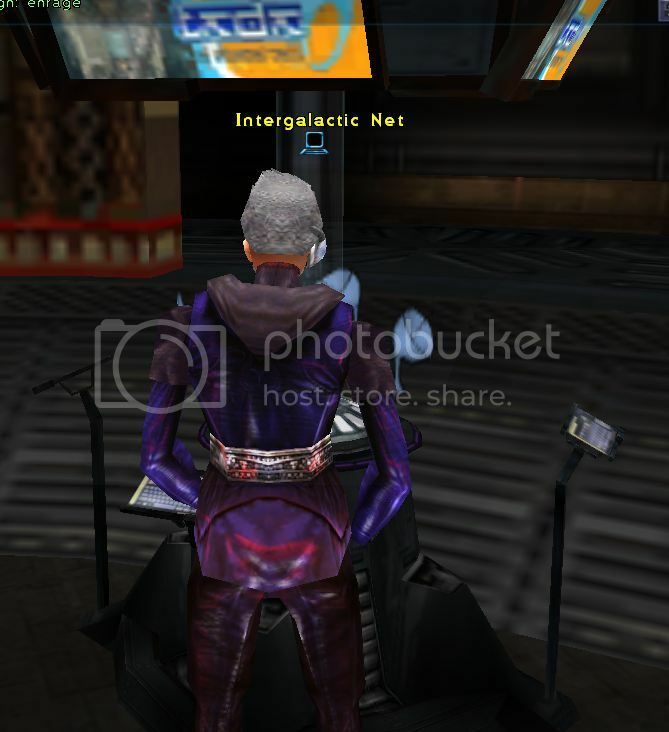 1st: get on the "Intergalactic Net" terminal. the one with the radar dish rotating around it. 2nd: Log onto the Net-7 Portal NOT the EMU forum using your favorite Web browser.
. The Portal has changed new look. 3rd: Choose the Avatar that has the Item IN THEIR HOLD that you want to mail. 4th: Select your "Inventory" Tab. 5th:Right click on the Item you want to mail Thats IN YOUR HOLD not your vault. 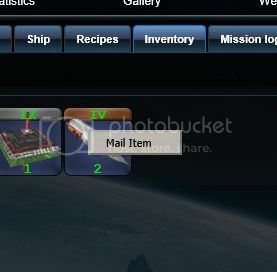 A "Mail Item" tab will pop up over the item to mail, Click on it. If the Mail Item Tab did not pop up YOUR NOT ON THE CHARACTER IN GAME THATS ON THE INTERGALATIC NET TERMINAL. 6th: The items details will then pop up. in this window you can add a message to the reciever of the item. You can charge him for it in this window, and you add a Player/Avatar's name in this window that also has a "Lookup Reciever" tab just in case your not sure of the spelling or the Avatar. Make sure you got it Right ! You will not get it back if it go's wrong ! no matter if its your fault or not. The DEVs and the GMs will not chase down lost items! Period. 7th: Select the Reciever of the item. 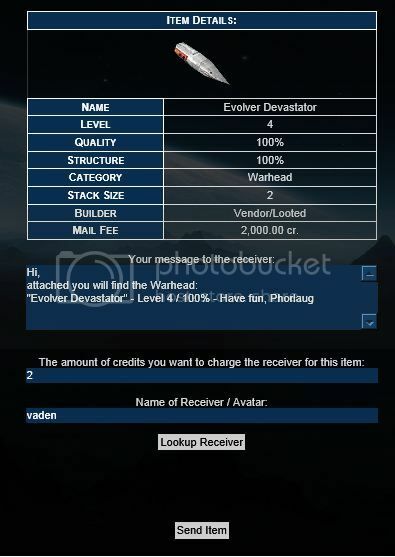 After you typed the name of the Avatar and clicked "Lookup Reciever"
8th: At the bottom of the item description window click "Send Item"
9th: At a successful mailing you will see this window. Important things you HAVE to remember. You have to be on the Character in game on the "Intergalatic Net" Terminal and On the NET-7 Portal AT THE SAME TIME thats doing the Mailing. People running multiple computers or two accounts from the same internet connection should NOT log into ingame-terminals with two toons from the same IP simultaneously, this is a safe ticket for trouble. There are still bugs with this and I'm confident that it will get better and streamlined. Just follow the way I have layed it out for you and it should work fine. I have used the Mail with an alt and with a guild mate so far. To Retrieve Mail that was sent to you or your ALT. 2) Login to the Net-7 Portal with the account that has the character thats recieving the item using your favorite Web browser. If you are being charged for the item you will have to except the Fee/cost of the item. before you can collect it, or refuse the mail. For "inter account transfer" it's more suitable to use the account vault. When you enter a price do not use a comma like 14,985. It will result it 14.00. Most of the time getting to character selection screen is easier and actually faster than finding a terminal. Basically like vault transfer, your character being offline is enough for this. Also you can claim items for toons other than the one you're currently playing. So if my JT has an item she needs to claim, I can have my JE claim it for her, and still have it appear in her hold. That meaning my JE is online, while my JT is not. Main JE and JT are on same account, don't know if that matters, but also have all accounts linked, so don't know if that matters either. So if my JT has an item she needs to claim, I can have my JE claim it for her, and still have it appear in her hold. Can you please elaborate detailed how you claim an item for another toon than the one it was sent to? Or are you mixing up "toon" and "account" when accessing the portal with linked(!) accounts? As far as I know, all my accounts are linked, since If I log in to any of my accounts, I see all the players I have on all my accounts. I don't know if my accounts being linked matters to what I'm talking about. It just might, but I'm not sure. What I'm saying is that if I get items for Torrie, Tera, and Terena from one of my guildies for them to analyze, but I'm playing as Terrell, I don't have to log Terrell out to claim those items for Torrie, Tera, or Terena on the portal. 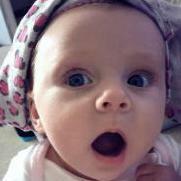 Torrie, Tera and Terrell are on the same account, while Terena is on my 2nd account. It doesn't seem to matter. Terrell can be logged in (and the only toon logged in), and I can use the portal to claim items for Tera, Torrie, and Terena, and when I log them in later each toon will have the correct items in their respective holds. I simply click on the receiving toons name, and follow the procedure to claim items, without the receiving toon needing to be logged in at all. I've also used the mail system (not account vault) to mail items from one alt to another without having to switch alts to claim the item. There have been times when I had Torrie build a device, and send it to one of my other toons, via the mail process. Without logging the other toon on, and Torrie still standing at the terminal, I've claimed the item for the other toon, whether the other toon is on the same account or not, and continued playing Torrie. When I come back later and log the other toon in, the item Torrie sent is there in the other toon's hold. So far I have not attempted to receive a mailed item, while none of my toons are logged into the game. I don't know if it's possible, only that the receiving toon does not have to be logged in to claim the item. Ah ok, tnx for explanation, like i mentioned already: Mix up of accounts/avatars. The way it's working is intended and correct - only the avatar sending an item must be in NTA mode or offline (because the receiver toon has no inventory change at all at this point). The receiver-toon must be offline or in NTA mode, when claiming the item. Sender Toon must be offline or in terminal mode to send. Once sent can resume activities or log on. Receiving Toon must be in terminal or offline to claim, but once claimed can log on or exit from terminal. Technically you can send items between your own toons (and claim them) without logging on at all. Assuming you have cargo space and credits they will be in your hold when you log in. Sound right? Does anyone actually use this feature? Still relevant in 2019 ?